The Tulsa Air and Space Museum & Planetarium is finalizing their plans for this year’s Aviator Ball. The theme is 50 Years of Apollo, Back to the Moon and the keynote speaker is NASA administrator, Jim Bridenstine. 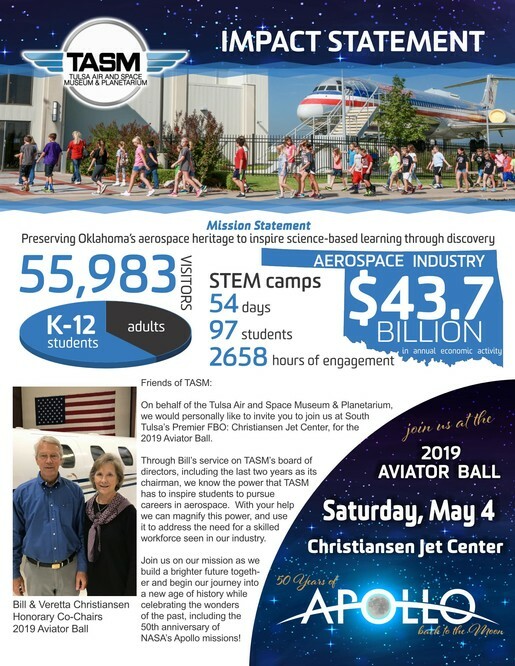 The event will take place at the Jones Riverside Airport and will include an hour of flight demonstrations as well as opportunities to meet with four of the five living Apollo astronauts with Oklahoma connections. TASM is very excited about this event and the support that it will generate for the Museum to further their mission to inspire science based learning through discovery! Below is the infomation packet to download.